Founder and chief executive officer of EbonyLife TV and EbonyLife Films, Mo Abudu was a year older yesterday, September 11th. She enjoyed the day with lunch at the CN Tower and dinner at TOCA Restaurant, Ritz-Carlton hotel, Toronto. She was joined at dinner by the cast and crew of The Royal Hibiscus Hotel, and a number of special guests, including Cameron Bailey, Creative Director, TIFF; Kiva Reardon, Programmer, TIFF; Masai Ujiri, President, Toronto Raptors; Moses Babatope, COO, FilmOne; Foli Coker, DG, NTDC; and Funa Maduka, Content Acquisition, Netflix. This is an extra-special birthday for the woman called ‘Africa’s Oprah’ by CNN and ‘super woman’ by Nigerian celebrity photographer, TY Bello. 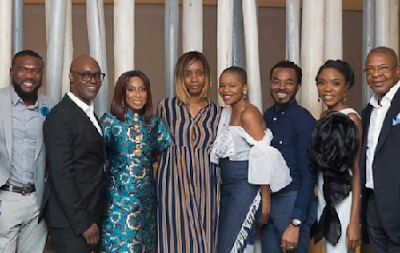 A new production from EbonyLife Films, The Royal Hibiscus Hotel, had its world debut on September 9th at Toronto International Film Festival. Here’s wishing the media and business powerhouse a very happy birthday and many more amazing years ahead. » Do You Think This Photo Is A Depiction Of Double Standard?